If you thought AT&T’s Black Friday deals were nice, wait until you see what the nation’s second-largest wireless service provider kept up its sleeve for Cyber Monday. 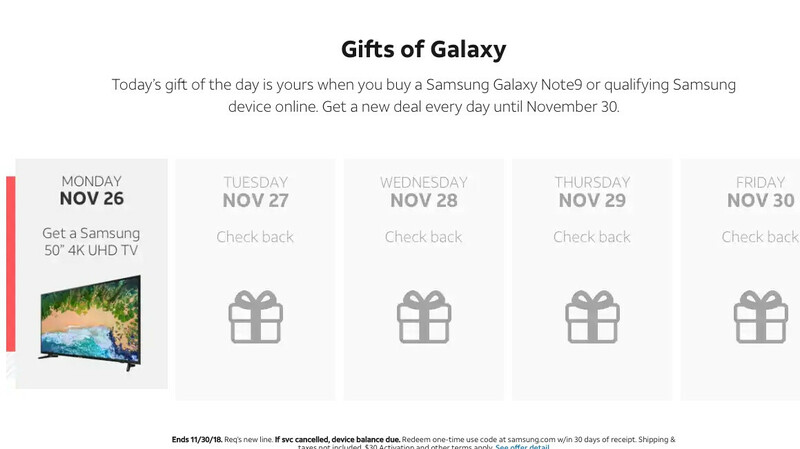 The “Gifts of Galaxy” promotion teased last week is now officially underway, and although the carrier plans to offer different freebies with “qualifying” Samsung smartphone purchases every day through Friday, you’d probably be foolish to turn down today’s killer bundle deal. That’s because the Galaxy Note 9, Galaxy S9, S9+, and even the Galaxy S8 Active are sold alongside a complimentary Samsung 50-inch 4K UHD TV at the time of this writing. Of course, nothing’s ever that simple, and certain terms and conditions apply. First and foremost, you’ll need to be a new AT&T subscriber or add a line of service to an existing plan to be eligible for that amazing freebie. Signing an AT&T Next or AT&T Next Every Year installment agreement is equally important, which means you won’t have to spend a dime upfront, but also that you’re basically agreeing to a good old fashioned carrier contract. If that doesn’t sound too inconvenient, the last thing you need to know is the free TV will not technically be shipped at the same time as your Note 9, S9, S9+, or S8 Active. Instead, you’ll want to keep an eye out for an email with instructions on how to redeem your offer within two weeks of today’s purchase. You’ll receive a code that needs to be used within an additional 30 days on samsung.com, although the model of the gratis TV doesn’t appear to be specified anywhere on AT&T’s website. This could either be the NU6900 or the NU7100, available from Samsung right now at $330 and $420 respectively after Black Friday discounts. In both cases you’d be looking at an unusually valuable gift, so you may want to pull the trigger while you still can.